I built this project for our first child, due in about 5 1/2 months. That makes this the first project I’ve ever completed before it was needed :). I googled and searched LumberJocks for cradle designs, although they are all very similar at their core, the varieties in the design and details were a little overwhelming at first. I finally settled on the gentle curves you see here and just a simple heart design at the head. Thanks Randy! Your design combined with that of Al Navas won hands down. I opted not to try my hand at hopper dovetails, and just angled the two sides out at 10 degrees. Walnut with a bit of Douglas Fir for the hearts. The base is screwed on and the rockers are attached with cleats. It about 36” long, 16” wide at the base and about 20” tall at the head. The curve of the rockers matches the head curve (roughly a 21.5” radius). All together I spent about 50 hours on this, spread over 5 weeks. Now, back to the wine rack that’s been put on hold a few times…something tells me if it’s not done before the baby comes, it’s going to be a long time before it gets finished. although at 9lbs 10oz, he wasn’t that little. Here’s my boy, Oliver, trying out the cradle, it stays in the living room. Thankfully, he seems to sleep in it alright, usually in the evening while we watch a bit of tv. -- If you don’t have time to do it right, when will you have time to do it over? That is really neat, great job. Very Nice! Great job on it! Devin, congrats on the soon to be baby. Your cradle is absolutely beautiful. Walnut is my favorite wood for furniture, and the dovetails and hearts are outstanding. You did a great job on the design with the soft curves. I appreciate the detailed description of your build. Thanks for posting. Really lovely job, love the luster of the walnut. Amazing work as always buddy! 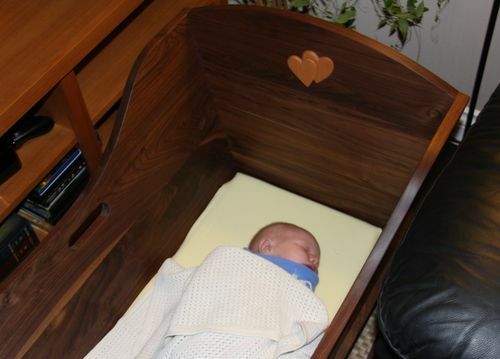 And the cradle is fantastic too! Congratulations my friend. Very nice, I like your decision to go with walnut. Nicely done, walnut looks great! -- The one thing about time is that time is always on time. That’s a wonderful cradle! Love the walnut, great design and awesome finish. The cute hearts are great accents. Excellent work and congrats on the firstborn! This is very nice. Congratulations.